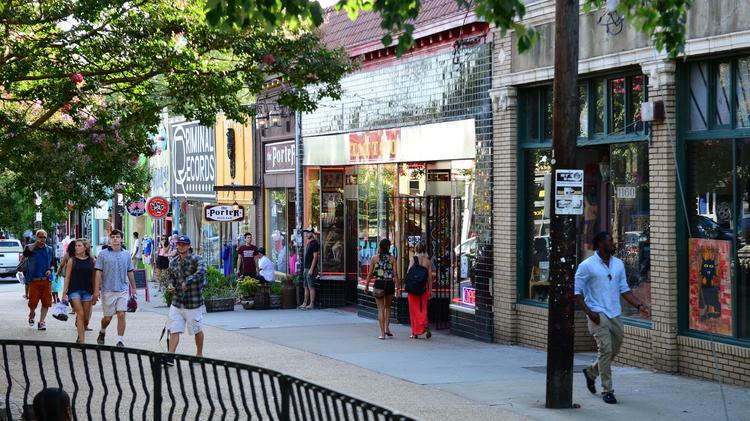 While strolling down the stained sidewalks of Little Five Points, drum beats played on turned over buckets pulse through the streets, the smell of street food fills the air, and an array of people explore the eclectic retail district. On the contrary, on the streets of Virginia Highlands there is a certain stillness. Other than the sound of cars passing by, the area has peacefulness to it. The restaurants are more uniform and so is the community. Surrounding the shops and restaurants are suburban homes with front porch swings and minivans. These two areas are in close proximity, but differ greatly. The built environments of Little Five Points and Virginia Highlands shape and are shaped by different groups of people due to differences in the historical foundation of the spaces, the layout of the streets, and the location of these neighborhoods in proximity to other influential spaces in Atlanta. An area’s historical background influences how the built environment of that space develops as time progresses. Since the late 1960’s, Little Five Points has been known for its odd knick-knack shops, antiques, and discount clothing (Wheatley). Even back then people knew they could go to Little Five Points to save money on picture shows, clothing, and other goods. It is interesting to see how that trend has stayed with and developed the area over the last fifty years. Because the neighborhood’s roots are deep into the eclectic culture of city living and freedom of expression, the area has not developed into anything more than just that. Because it has been “known for” a certain type of merchandise and culture, this image has shaped the built environment a great deal and stayed with the space for many years. Even today, Atlantans know they can go to Little Five Points and come back with a funky new pair of sunglasses and a stomach full of cheap (but delicious) food. As for Virginia-Highlands, even back in the 1960’s the area began transforming into a family-oriented, upscale neighborhood (Virginia-Highland: A Rich History). Young professionals and families began moving into the area and renovating old homes and utilitarian storefronts into boutiques and restaurants. The area transformed into a city-walk with a suburban feel, well equipped with parks and excellent schools. What really drew the community in close was the announcement that a major highway, I-485, would run right through the beautiful neighborhood, disrupting what the community had created and destroying hundreds of homes. A group of civilians decided to fight back and formed the Virginia-Highland Civic Association; the group was successful in putting a stop to the highway plans (Virginia-Highland: A Rich History). A group like this taking shape within a built environment build a foundation for a strong community and a “work together” attitude. The Virginia-Highland Civic Association is still an active group within the neighborhood to this day. 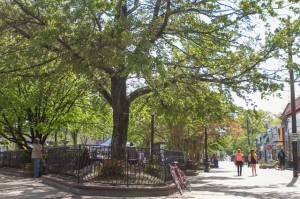 Even fifty years ago, Little Five Points and Virginia-Highlands began to differ in community, which in turn transformed both neighborhoods into unique areas. The layout of both neighborhoods is different in many ways, but each serves a purpose for the built environment and caters to the community. 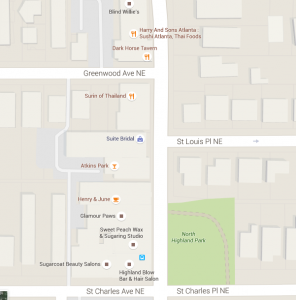 In Little Five Points, there is one large communal area in the center of the neighborhood, known as Findley Plaza. All the restaurants and shops surround the large area, which is equipped with benches, trees, and always filled with street musicians. Compared to Virginia-Highlands, Little Five Points is smaller and although there are residential homes, they are not really included in to the main retail area of the space. This can be seen from the photograph shown below: the communal area allows for a “hang out” spot for those strolling around the area, while the homes are located in a different part of the neighborhood. This type of built environment accommodates a younger, more social crowd. The central area provides groups a space to spread out and socialize. 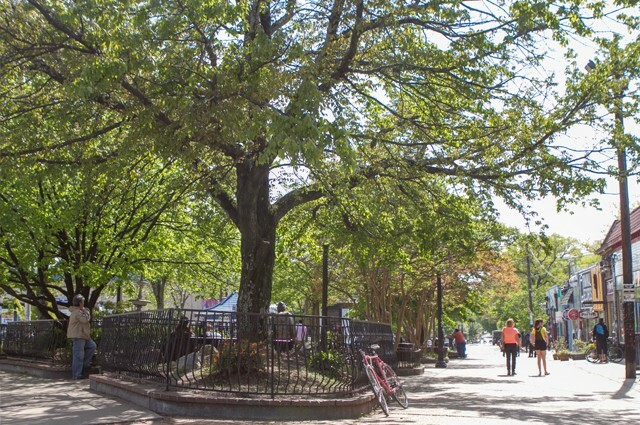 This spot is always a meeting place in Little Five Points. There are friends embracing and then going on their way to explore the remainder of the eclectic neighborhood, street musicians jamming on various instruments, and pedestrians walking their dogs. Branching off from Findley Plaza is the main street, Euclid Avenue, where all the funky shops and restaurants are located. 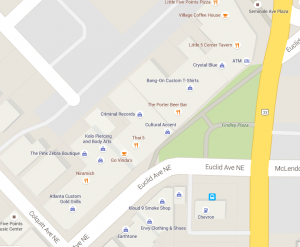 Below is a screenshot of a map of Little Five Points that shows how Findley Plaza is the common area within the retail area of Little Five Points. The layout of the built environment in Virginia-Highlands differs greatly from that of Little Five Points. The major retail strips are directly across from the residential areas. This aspect of the layout shows how the area is more family-oriented, which is why the retail area is more reserved and quiet. When I visited Virginia-Highlands for my exterior built environment description I noticed that the aural characteristics of the space were very quiet; here is one of my sound recordings (Hegner). Out on the street the only noises to be heard were cars passing by and an occasional dog barking. There are no street musicians, loud chatter, or boisterous music filling the air in Virginia-Highlands. There is a certain calm in this area during the day, which I think has to do with the layout of the neighborhood. The residential area surrounding the shops is one reason why the area is much more composed; another reason for this is the parks located in Virginia-Highlands. In one of the major retail spots, North Highland Park is across the street from the retail area. To be able to walk out of a restaurant or coffee shop and cross the street to a peaceful park is a major characteristic of this built environment. Parks take away from the hustle and bustle of the city and influence the area in a positive way. A screenshot of the park mentioned is pictured below, which shows how it is surrounded by shops and homes. The areas that surround a neighborhood influence the type of community that settles there and overall help shape the built environment. The neighborhoods surrounding Virginia-Highlands are Midtown, Druid Hills, and Ansley Park, which are all upper to middle class areas. The areas surrounding Little Five Points include Old Fourth Ward, Edgewood, and Downtown, all of which consist of a middle to lower class population and vary more racially. One major influence of an area’s built environment is household income. The average household income changes drastically when going from Little Five Points to Virginia-Highlands. For instance, the average income in Little Five Points ranges from $66,000 to $76,000. Whereas in Virginia-Highlands this span is more like $109,000 to $128,000 (City Data). With the income being almost double this, the Virginia-Highlands draws in a more family oriented, upscale community. This may just sound like a matter of real estate, but household income trickles down to the types of shops and restaurants built in the area, the upkeep of the streets and sidewalks, and the type of community that settles in that particular built environment. As for Little Five Points, the neighborhood has a significantly lower household income and this can be seen by observing the built environment. The used goods, vintage apparel shops, and thrifty stores are an indicator of a whole different community that has taken root (Lydia Bohanan). The shops would not be there if the population of Little Five did not frequent them. For instance, the new designer shops in Buckhead that were recently built would not be seen in an area like Little Five Points. These shops would quickly go out of business because the type of clientele that they cater to does not reside in Little Five. The retail district of a neighborhood adapts to the type of people that reside there, and overall their income as well. Therefore, the areas surrounding these to spots have some effect on the type of community and how the built environment adapts. Overall, when observing the built environment of a neighborhood there is so much more to it than meets the eye. Before I researched these two places, they were merely two neighborhoods I drove through on occasion while exploring Atlanta. Now after exploring them in full, I can say with confidence that Little Five Points and Virginia Highlands are different in so many ways, despite the less than two mile difference between them. That is another interesting component that comes into play, Little Five Points and Virginia Highlands are within such close proximity, but differ greatly. That is the beauty of the built environment of a city, you can can walk two miles down the road and experience a whole new atmosphere. This all has to do with the historical foundation that the neighborhoods were built on, the layout of the streets and attractions, and the surrounding places. All three of these factors shape and cause a certain crowd to gather and settle, which in turn forms the type of housing, shops, restaurants, and communal areas that shape an area’s built environment. “Atlanta, Georgia (GA) Income Map, Earnings Map, and Wages Data.” City Data. Accessed April 26, 2016. http://www.city-data.com/income/income-Atlanta-Georgia.html. Lydia Bohanan. “Exterior Built Environment Description: Little Five Points.” Blog. Lydia’s Blog, February 13, 2016. http://sites.gsu.edu/lbohanan1/2016/02/13/exterior-built-environment-description-little-five-points/. Rachel Hegner. “Exterior: Virginia Highlands Digital Record #4.” Blog. RHEGNER 1’s Blog, February 13, 2016. http://sites.gsu.edu/rhegner1/2016/02/13/exterior-virginia-highlands-digital-record-4/. Thomas Wheatley. “How Did Little Five Points Get Weird?” Newspaper. Creative Loafing Atlanta. Accessed April 19, 2016. http://clatl.com/atlanta/how-did-little-five-points-get-weird/Content?oid=17069654. While strolling down the stained sidewalks of Little Five Points, drum beats played on turned over buckets pulse through the streets, the smell of street food fills the air, and an array of people explore the funky shops. On the contrary, on the streets of Virginia Highlands there is certain stillness. Other than the sound of cars zooming by, the area has peacefulness to it. The restaurants are more uniform and so are the people. Surrounding the shops and restaurants are suburban homes with front porch swings and minivans. These two areas are in close proximity, but differ greatly. 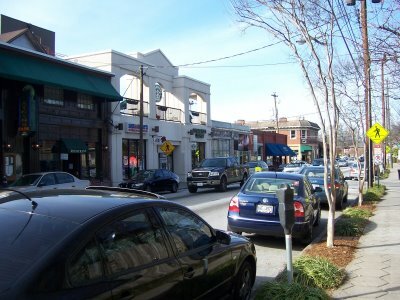 The built environments of Little Five Points and Virginia Highlands shape and are shaped by different groups of people due to differences in the historical foundation of the spaces, the layout of the streets, and the location of these neighborhoods in proximity to other influential spaces in Atlanta. An area’s historical background influences how the built environment of that space develops as time goes on. Since the late 1960’s Little Five Points has been known for its odd knick-knack shops, antiques, and discount clothing (Wheatley). Even back then people knew they could go to Little Five Points to save money on movie theaters, clothing, and other goods. It is interesting to see how that trend has stayed with and developed the area over the last fifty years. Because the neighborhood’s roots are deep into the eclectic culture of city living and freedom of expression, the area has not developed into anything more than just that. Because the area has been “known for” a certain type of merchandise and culture, this image has shaped the built environment a great deal and stayed with the space for many years. As for Virginia-Highlands, the area has been family-oriented and more upscale than Little Five Points since the 1960’s (Virginia-Highland Civic Assn.). Young professionals and families began moving into the area and renovating old homes and utilitarian storefronts into boutiques and restaurants. The area transformed into a city-walk with a suburban feel, well equipped with parks and excellent schools. What really drew the community in close was the announcement that a major highway, I-485, would run right through the beautiful neighborhood, disrupting what the community had created and destroying hundreds of homes. A group of civilians decided to fight back and formed the Virginia-Highland Civic Association; the group was successful in putting a stop to the highway plans. Even fifty years ago, Little Five Points and Virginia-Highlands began to differ in community, which in turn transformed both neighborhoods into unique areas. This type of built environment accommodates a younger, more social crowd. The central area provides groups a space to spread out and socialize. This spot is always a meeting place in Little Five Points. There are friends embracing and then going on their way to explore to remainder of the eclectic neighborhood, street musicians jamming on various instruments, and pedestrians walking their dogs. Branching off from Findley Plaza is the main street where all the funky shops and restaurants reside. 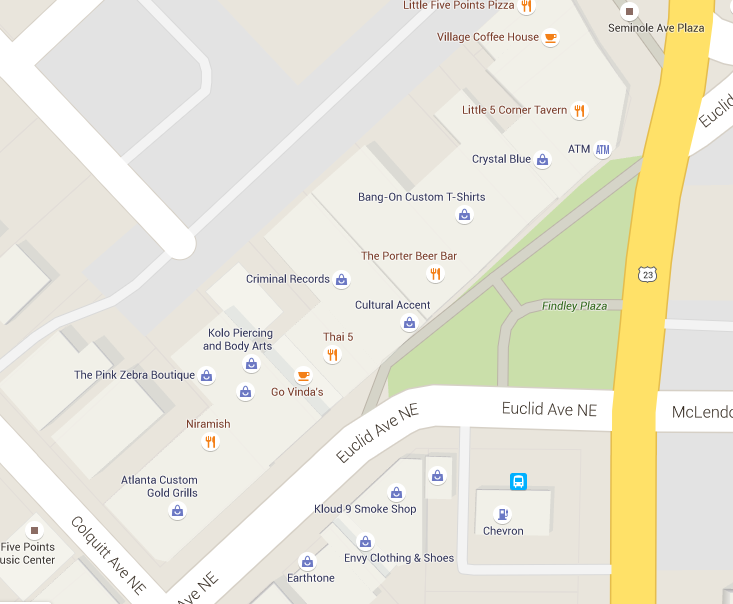 Below is a screenshot of a map of Little Five Points that shows how Findley Plaza is the common area within the retail area of Little Five Points. The layout of the built environment in Virginia-Highlands differs greatly from that of Little Five Points. The major retail strips are directly across from the residential areas. This aspect of the layout shows how the area is more family-oriented, which is why the retail area is more reserved and quiet. When I visited Virginia-Highlands for my exterior built environment description I noticed that the aural characteristics of the space were very quiet; here is one of my sound recordings. Out on the street the only noises to be heard were cars passing by and an occasional dog barking. There are no street musicians, loud chatter, or boisterous music filling the air in Virginia-Highlands. There is a certain calm in this area during the day, which I think has to do with the layout of the neighborhood. The residential area surrounding the shops is one reason why the area is much more composed; another reason for this is the parks located in Virginia-Highlands. 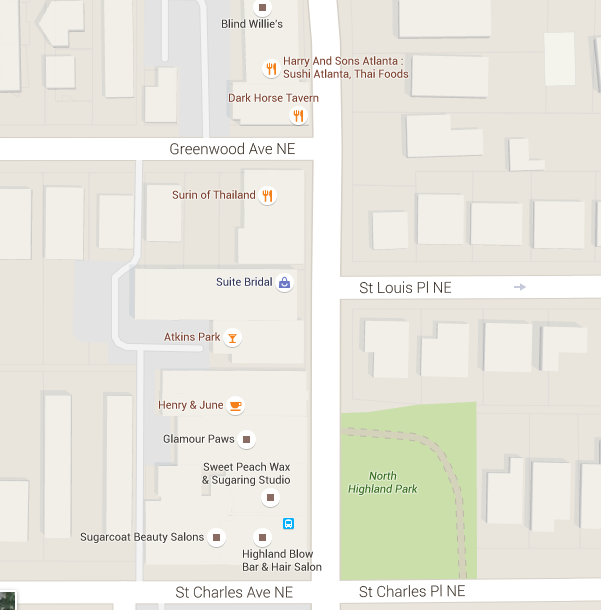 In one of the major retail spots, North Highland Park is across the street from the retail area. Parks take away from the hustle and bustle of the city and influence the area in a positive way. A screenshot of the park mentioned is pictured below, which shows how it is surrounded by shops and homes. The areas that surround a neighborhood influence the type of community that settles there and overall help shape the built environment. The neighborhoods surrounding Virginia-Highlands are Midtown, Druid Hills, and Ansley Park, which are all upper to middle class areas. The areas surrounding Little Five Points include Old Fourth Ward, Edgewood, and Downtown, all of which consist of a middle to lower class population and vary more racially. One major influence of an area’s built environment is household income. The average household income changes drastically when going from Little Five Points to Virginia-Highlands. For instance, the average income in Little Five Points ranges from $66,000 to $76,000. Whereas in Virginia-Highlands this span is more like $109,000 to $128,000 (Income Map). With the income being almost double this, the Virginia-Highlands draws in a more family oriented, upscale community. This may just sound like a matter of real estate, but household income trickles down to the types of shops and restaurants built in the area, the upkeep of the streets and sidewalks, and the type of community that settles in that particular built environment. As for Little Five Points, the neighborhood has a significantly lower household income and this can be seen by observing the built environment. The used goods, vintage apparel shops, and thrifty stores are an indicator of a whole different community that has taken root. For instance, the new designer shops in Buckhead that were recently built would not be seen in an area like Little Five Points. These shops would quickly go out of business because the type of clientele that they cater to does not reside in Little Five. The retail district of a neighborhood adapts to the type of people that reside there, and overall their income as well. Therefore, the areas surrounding these to spots have some effect on the type of community and how the built environment adapts. Overall, when observing the built environment of a neighborhood there is so much more to it than meets the eye. Before I researched these two places, they were merely two neighborhoods I drove through on occasion while exploring Atlanta. Now after exploring them in full, I can say with confidence that Little Five Points and Virginia Highlands are different in so many ways, despite the less than two mile difference between them. That is another interesting component that comes into play, Little Five Points and Virginia Highlands are within such close proximity, but differ greatly. This all has to do with the historical foundation that the neighborhoods were built on, the layout of the streets and attractions, and the surrounding places. All three of these factors shape call a certain crowd to gather, which in turn forms the type of housing, shops, restaurants, and communal areas. Rachel Hegner. “Annotated Bibliographies 1,2, and 3.” Blog. RHEGNER1’s Blog, February 6, 2016. http://sites.gsu.edu/rhegner1/2016/02/06/annotated-bibliographies-12-and-3/. The areas that surround a neighborhood influence the type of community that settles there and overall help shape the built environment. The neighborhoods surrounding Virginia-Highlands are Midtown, Druid Hills, and Ansley Park, which are all upper to middle class areas. The areas surrounding Little Five Points include Old Fourth Ward, Edgewood, and Downtown, all of which consist of a middle to lower class population and vary more racially. One major influence of an area’s built environment is household income. The average household income changes drastically when going from Little Five Points to Virginia-Highlands. For instance, the average income in Little Five Points ranges from $66,000 to $76,000. Whereas in Virginia-Highlands this span is more like $109,000 to $128,000 (Income Map). With the income being almost double this, the Virginia-Highlands draws in a more family oriented, upscale community. This may just sound like a matter of real estate, but household income trickles down to the types of shops and restaurants built in the area, the upkeep of the streets and sidewalks, and the type of community that settles in that particular built environment. As for Little Five Points, the neighborhood has a significantly lower household income and this can be seen by observing the built environment. The used goods, vintage apparel shops, and thrifty stores are an indicator of a whole different community that has taken root. For instance, the new designer shops in Buckhead that were just built would not be seen in an area like Little Five Points. These shops would quickly go out of business because the type of clientele that they cater to does not reside in Little Five. The retail district of a neighborhood adapts to the type of people that reside there, and overall their income as well. Little Five Points and Virginia-Highlands are within close proximity, but seem worlds apart due to the communal differences in income, the surrounding neighborhoods, and the age range of the Atlantans that affiliate with these areas. 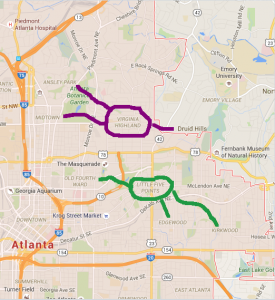 The built environments of Little Five Points and Virginia Highlands shape and are shaped by different groups of people due to differences in the historical foundation of the spaces, the layout of the streets, and the location of these neighborhoods in proximity to other influential spaces in Atlanta. Living Walls is a non-profit organization in Atlanta that strives to educate Atlantans about public space and widen perspectives through street art. The organization was founded in 2010 and not only showcases art, but also uses it to change the built environment for the better by jazzing up the city walls with color and life. Living Walls hosts an international conference every year in Atlanta that brings in twenty artists form around the world. During the conference, each artist produces their own wall, providing the city with diverse street art. Below is a video from Youtube that provides more information about the artists and how the Living Walls organization has impacted them and the city of Atlanta. The Living Walls digital space is set up rather simply. The homepage consists of three photographs that rotate as the background, the organization’s logo, and several tabs that link to different parts of the site: About, The Artists, Walls, Sponsors, Contact, Store, and Donate. By exploring these tabs viewers can learn about the organization’s goals and concepts, the artists and their origins, where the walls are located, who sponsors them, and information on how to donate. The store tab is currently under construction, so I was not able to delve into that part of the site. Each one of these tabs is clean cut and gives a short summary of information. I found the “Walls” tab and “The Artists” tab to be the most interesting. The “Walls” tab displays an interactive map showing where each wall is located, the address, and a link to the artist’s profile. “The Artists” tab shows a list of all ninety-five artists, where they are from, photographs of their street art in Atlanta, and some even have a short bio. No matter what part of this digital space you are exploring, each page is filled with color. The array of color used throughout the site makes it fun to dig deeper into the world of Living Walls. The Living Walls digital space advertises itself in a simple and non-invasive way. In the top right corner of the site, logos of five different social media companies are displayed. Clicking on each of these brings you to the Living Walls page for that social media site, such a their Facebook or Instagram pages. This allows viewers to easily access and follow Living Walls on social media. Also, a “Share” button in the bottom right corner of the site provides an opportunity for people to share the Living Walls link on their own social media accounts. This type of marketing tells a lot about what type of audience the non-profit organization is targeting: millennials or others who are actively on social media. Those who are most likely to use this site are artists, Atlantans looking to get involved in the community, young adults/students, and possible sponsors who are looking to donate. Lastly, this site made me feel welcome and sparked my curiosity about Living Walls and I plan to visit some of the murals in the near future. The “Sponsors” tab links to a page that shows the numerous sponsors supporting the Living Walls organization. This page is organized from high to low, meaning the sponsors who have given the most are listed at the top and as you scroll down the amounts decrease. The digital space gives a special thanks to the sponsors and states that Living Walls would not be what it is today without them. Each sponsor’s logo is present and can be clicked on so viewers can visit the different sites and see what each company is about. This is the homepage for the Living Walls website. Being the first thing that viewers see when entering this digital space, the page is quite simple and pleasing to the eye. The photograph shows a beautiful shot of Atlanta and to the bottom left a multi-colored Living Wall can be seen. At the top of the page, the organization’s simple logo is present, along with seven headings that lead to other parts of the site. Above those headings are logos of different social media sites, which link to the Living Walls pages for Facebook, Instagram, and so on. This is a screenshot of part of “The Artists” tab. This page is easy to maneuver and very simple, yet informative. There are ninety-five artists, so the sheer size of the list shows viewers how many different artists have contributed to the Living Walls movement. Each of these names can be clicked on and in doing so, photographs of their work appear as the background, their hometown and more information about who they are as an artist are listed. These artists come form all over the world. As I explored this page I noticed there were people from Russia, France, The United States, Italy, South Africa, Israel, Argentina, Switzerland and so many more. Below is a shot of one of the artist’s pages. 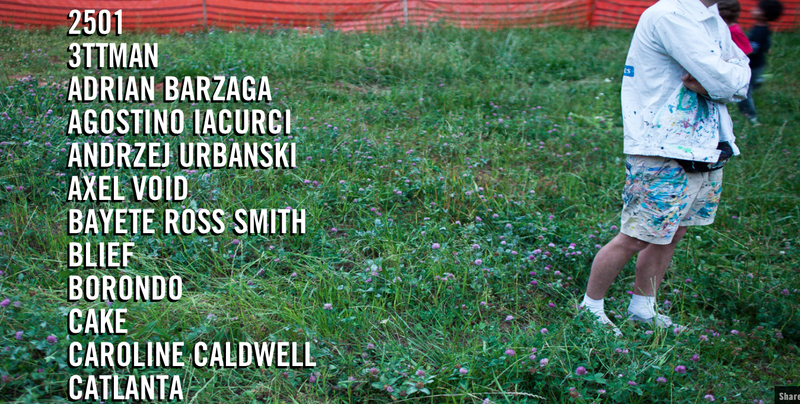 Living Walls is a website dedicated to building up the Atlanta community through street art. These pictures are of the “Misson Statement” page under the About tab. Their mission is to promote, educate, and change the community’s perspective about public space by using art. This is such a unique and creative way to create a positive outlook about the built environment. The fact that the mission statement is clearly stated on the website helps viewers to understand the organization’s overall goal. This is the map that is shown when you click on the “Walls” tab on the Living Walls homepage. 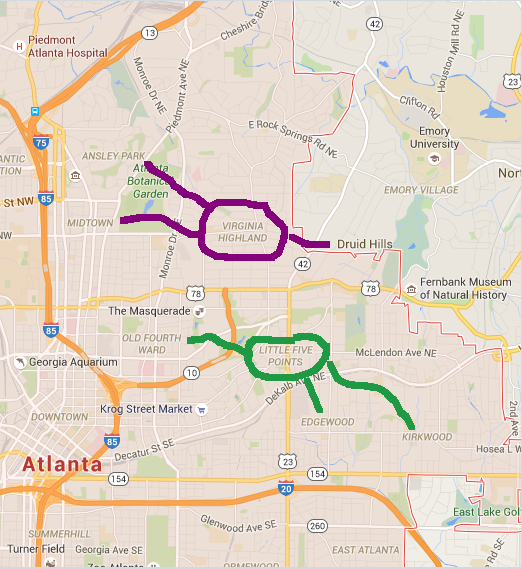 The walls are scattered in all directions across Atlanta, with some being further away from the heart of the city. There are living walls in Decatur, Inman Park, Buckhead, Cabbagetown, Little Five Points, and Eastpoint, just to name a few. When you click on each blue pinpoint, a description box appears. The artist’s name, location of the wall, and a photograph of the wall are listed. This map clearly presents how many walls there are and how spread out the locations are all across the city.